Gigworker provides information, resources, and training for people working in the gig economy. Whether you’re looking to get started or taking your earnings to the next level, we’re there for you every step of the way. 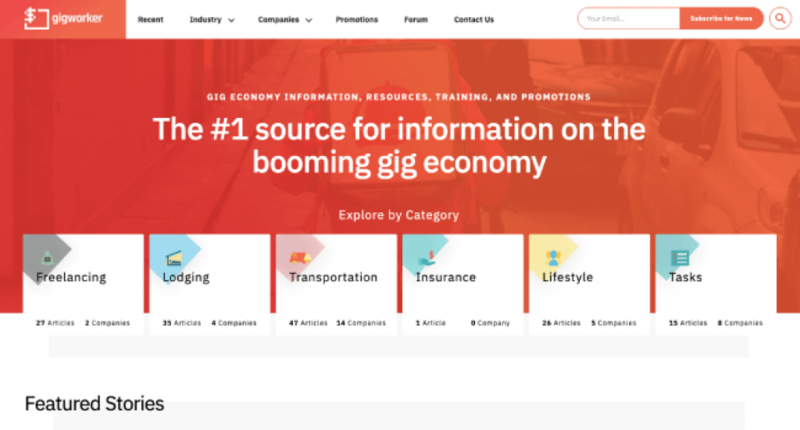 GigWorker’s mission is to share valuable information regarding the gig economy to everyone from beginners looking to start a side hustle, to gig economy veterans trying to expand their empire. GigWorker is the #1 source for all things gig-related. We cover a wide range of gig economy opportunities, including rideshare, delivery, scooter charging, tasks, caretaking, property rental, and everything in between. We also provide useful information on the business side of the gig-economy, including freelance tax issues, insurance, and more. Whether you’re looking for promo codes to earn more money or new opportunities to expand your income, GigWorker provides the information you need to gain a competitive advantage. What problems does Gigworker solve? Gigworker.com fills the information gap void between people working in the gig economy the jobs available to them. I am a former Uber/Lyft driver, and I started a website called Ridester.com. Two years ago I quit my full time job to grow the site after seeing a void in the information available to rideshare drivers. Since then, I’ve scaled Ridester, the go-to resource of the rideshare industry, from just a few hundred visitors per month, to over 1,500,000 visitors per month. We have a 20% growth rate month over month from there. I’m an entrepreneur who specializes in building, growing, and maintaining successful websites. I’m probably best known as the owner of Ridester.com – a rideshare information site that provides expert insights on the gig economy to over 1,500,000 readers each month. I’m applying the framework I used to scale Ridester to my newest project, Gigworker.com. When I’m not overseeing my team of writers, I spend as much time as possible reading, working out, or playing with my dog Baxter (insert Anchorman reference here). Looking to partner up to grow your website traffic or work on a new venture? Send me a message and we’ll see how we can work together.